There’s nothing easier and more reliable than a cheese board when hosting a party. With the Fall season upon us and Thanksgiving around the corner, I thought it would be fun to put together a tutorial on how to set up a beautiful Fall Harvest Cheese Board so you can wow your guests during the holiday season. Enjoy! ? So who’s excited for all of the holiday partying ahead of us? ? If you cringed a bit at the above question, no worries. The truth is, I’m right there with you! As much as I love the holidays, they do bring a little stress, especially if you are a perfectionist like me. Hosting a party is fun but is definitely hard work. Between coming up with the guest list, planning the menu, cleaning the house, decorating, shopping and preparing food, it can be quite an endeavor. After not enjoying a few parties due to stress, I now try to simplify as much as I can. One of my “hacks” is putting together a big cheese board in lieu of preparing appetizers. Not only it is always a crowd-pleaser, but it also makes your table or buffet look stunning and elegant. The success of a good cheese board relies on variety. 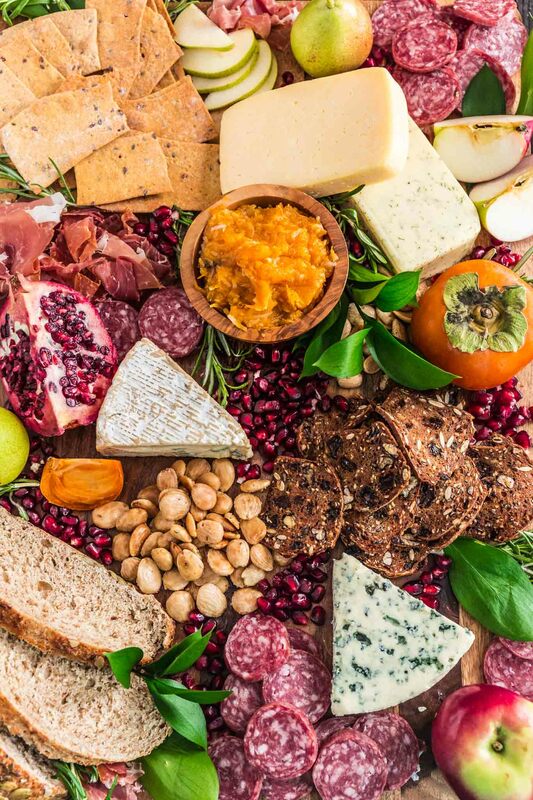 Sure, you can adapt any cheese board for different occasions, palates and budget, but you should always aim for a balanced board that gives your guests as wide a range of experience as possible. Think different textures, contrasting flavors and lots of pretty autumnal colors. After all, people eat with their eyes before they even taste the food. So, without further ado, let’s start with the most important part. I usually go for 3-4 varieties of cheese for a big cheese board. If you’re on a budget, choose 2 high quality cheeses as opposed to buying 4 cheap low quality ones that nobody will touch. A good rule of thumb is to have one hard cheese, one soft cheese, one blue cheese and one aged cheese. You can get creative and get one fun flavored cheese to spice up your cheese board, but I wouldn’t over do it. The classics are usually the way to go! For this Fall Harvest Cheese Board, I decided to stick with Castello Cheese. I got one Aged Havarti, one Dill Havarti (as my fun and creamy choice), one Danish Blue Cheese and one Classic Blue Brie. So, technically, I went with two blue varieties, but in my case it was okay since we are a blue cheese loving family! If you and/or your guests are not into the strong pungent flavor of a blue cheese, don’t worry. Castello has other cheeses you can choose from, like cheddar, other kinds of havarti and double cremes. Make sure to take your cheeses out of the fridge about 30-45 minutes before serving. Letting them breathe at room temperature brings out nuances of flavor and aroma. I think this is my favorite part. I just love all the Fall produce and its flavors and colors! I like to add them whole as decoration as well as have them sliced or halved/quartered so people can just grab and eat. For my cheeseboard, I added fresh persimmons, apples, pears and a pomegranate. I wish I could have found figs, but I guess they are all gone by this time of the year in NY. There’s always dried figs, I know, but fresh is so much better. If you can still find figs, add them! They pair amazing with any type of cheese. Grapes are another popular choice and also in season right now. Snip them into little stems of two or three grapes to make it easier for your guests to grab them. Sweet and salty is my mojo, so I love pairing my cheese board with a good jam or honey. For the fall harvest theme, my favorites are fig jam or my spiced pumpkin coconut compote. You can also add other fruit spreads, savory spreads (like tomato chutney or a butternut squash spread), mustard, balsamic vinegar syrup, olives, marinated vegetables and/or pickles. Make sure whatever you choose complements the flavors of the cheese and fruits you’ve picked. After all, the accompaniments are there in order to best appreciate the taste of the cheese. I guess nuts could have been included in the spreads category, but I like them so much that I decided they needed to shine on their own! I like spiced or herbed nuts, like the Rosemary Garlic Almonds that I used for this board. Candied walnuts also have a special place in my heart and they are very popular during the holidays. If you’re going for almonds, go ahead and splurge on Marcona almonds. They are from Spain and are more rounded and plump than the other varieties. They are also softer, sweeter and more delicate! Oh, they are just so delicious and if you haven’t tried them, you absolutely must! Although not necessary – especially if your crowd is mostly vegetarian – it is always nice to add two or three types of cured meats, like salami and Prosciutto di Parma. No need to go crazy, as the focus should be on the cheese. Otherwise it becomes a charcuterie board and I guess that’s a subject for a future post. ? One or two types of gourmet crackers and you are good to go! I’ve been completely obsessed with Lesley Stowe’s Raincoast Crisps, especially the Rosemary Raisin Pecan ones. Seriously, I devoured the whole package by myself and I don’t even feel guilty about it! They also have flatbreads and they add a new shape to make your Fall Harvest Cheese Board even more fun. As for bread, any crusty beautiful bread – like a baguette or a sour dough – will do. You should slice it to make it easier on your guests. Again, no need to go crazy. One type of bread will do! If you need to choose between the bread or crackers, go for the crackers! They are easier to grab and the crunchy texture is a great contrast to the cheeses and fruits. The not so harsh truth is: a cheese board must always be paired with wine. Sparkling or still wine, I don’t care, as long as it’s good wine! I paired my Fall Harvest Cheese Board with this smooth Pinot Noir from Folie à Deux. It is an incredibly versatile red and it pairs well with a wide range of cheeses. All that is left to do is assemble your cheese board. A beautiful wood board is always a good choice, but marble or ceramic work as well. If you don’t have one and can splurge, buy one as it will last you many, many years. If it’s not on the budget, any beautiful big platter will do. But you might need to set up two or three, depending on how many guests you have! I like to assemble my cheese board where it will “live” during the party, so I don’t have to move it once it is ready. Place the cheeses down first and then start working around them. It’s okay if things hang off the board or if you have to tuck things under each other. As you can see, I decorated the empty spaces with pomegranate seeds, fresh rosemary and some beautiful green leaves that I bought at the florist. I like to see myself as a Michelangelo, playing around with the textures and colors. As if the wooden board is my canvas and the finished Fall Harvest Cheese Board is my masterpiece! Whatever ingredients or presentations you pick, I am sure this beautiful cheese board will be a hit at your next party. You should use this tutorial as a guide, and go ahead and incorporate your own tastes to it. A cheese board has to be fun and, above all, has to be something you’ll enjoy eating! Okay, now it’s your turn. What would you add to your Fall Harvest Cheese Board? Any fruits that I didn’t mention? Any other cheeses? What is your favorite combination? ? Remove the cheese from the fridge 30-45 minutes before serving. 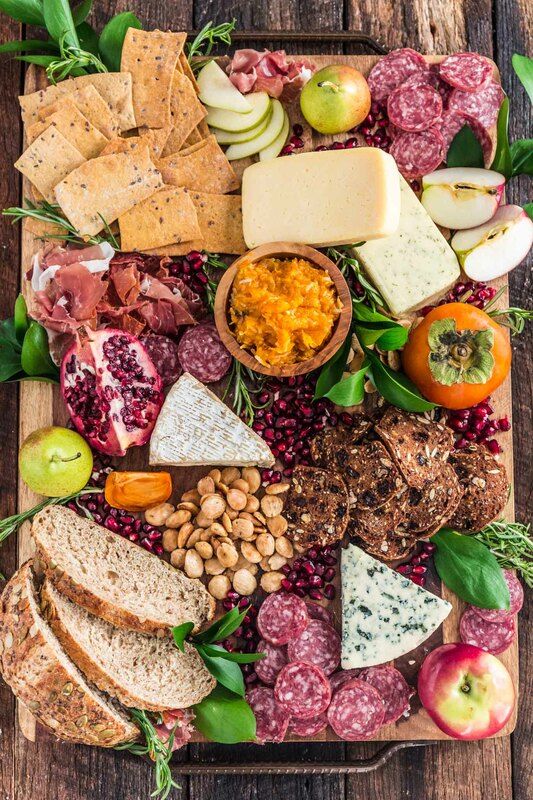 Arrange the cheese on a large board or platter and starting working around them, adding the fruits, spreads, nuts (below), charcuterie and crackers/bread. Fill in the gaps with fresh herbs, leaves, nuts or pomegranate seeds. With the flat of a chef's knife, smash the garlic cloves; discard peel. Heat oil in a large skillet, over medium low heat. Add the garlic and saute for about 5 minutes, until it starts to color and releasing oils. Lower the heat if the garlic starts to burn. Remove and discard garlic. Add the almonds and let them coat into all that amazing oil, stirring constantly so they don't burn, about 5 minutes. As soon as they start browning, remove from heat and add rosemary, salt and pepper. Allow to cool in pan, remove with a slotted spoon to a container and serve within two days.